Jorge Valdiva left Palmeiras, said his goodbyes. Posed with Al Fujairah directors, receiving flowers and all. Allegedly sealed a deal. Then took 10 days off, travelling to Disney. 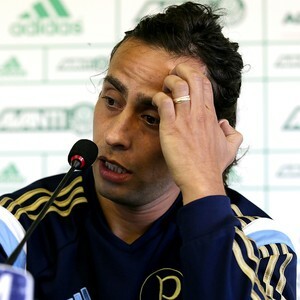 At a press conference in São Paulo last Thursday, Valdivia explained he had no way of knowing the deal never went through, that “the dad of the sheik running the club wanted the money for hospitals and schools”. Thus, Valdivia aka Walt Divia (or Valdisney, your pick) is back at Palmeiras, says he’s happy to be so, never wanted to leave really. Reintegrated in the squad, training hard, he should make his new debut against São Paulo on Sunday 17 August. However unlikely the story Valdivia (and Palmeiras too, for that matter) presents, there’s one thing more important at the moment: Palmeiras need Valdivia. Be it for a few games before he’s truly passed on to another club for a hefty sum, be it for staying the whole season and significantly raise the offensive quality of Palmeiras’ midfield. For now, it’s all about swallowing pride and doing the best of the situation, even if that means admitting the Master Trickster back. Palmeiras need to urgently climb positions in the Brasileirão tables. And will also need Valdivia for the remainder of the Brazil Cup, now that the team have advanced to the last 16 after eliminating Avaí from Florianópolis. Things seem more straightforward with Jonathan Cristaldo. The 25-year-old Metalist attacker from Argentina arrived in São Paulo Friday early morning and passed his medical exams. Still awaiting some documents, he’s expected to sign and be formally announced on Monday. Expected. If not before, the Mickey Mouse transfer involving Valdivia teaches us never to celebrate before ink has been left drying on paper. Gareca has been testing 17-year-old Gabriel Fernando from the youth academy. Rightly so: the kid has so far scored 21 goals in eight games in the São Paulo U17 championships. Training with the first team gives him the opportunity to get used to the different rhythm and pressure. I don’t believe Gareca will integrate the kid into the squad quite yet, but Gareca is known for giving promising players a shot at stardom. Stay tuned. Tomorrow Palmeiras take on Atlético Mineiro – restructuring after the exit of Ronaldinho Gaúcho. With Diogo back after a muscular injury and Allione giving offensive direction on the midfield, Palmeiras are going after the three points in this difficult away game. In the midst of all uncertainties, one thing we palmeirenses have always known is that Palmeiras are the first World Club Champions. Those who witnessed the feat in 1951 knows it. And you don’t have to dig far for proof, just check out newspapers from the era. The Rio Cup of 1951 – a tournament where the best teams on the planet had been summoned to participate in what can only be described as the first International Interclub Championship – included Nacional – the base of Uruguay’s 1950 World Champion National Team; Juventus (Italy), Olympique de Nice (French champions) the Red Star (Yugoslav champions) and Sporting (Portuguese champions). Brazil was represented by Palmeiras and Vasco da Gama (Rio de Janeiro). The final was played in two turns and Palmeiras got the better of Juventus. 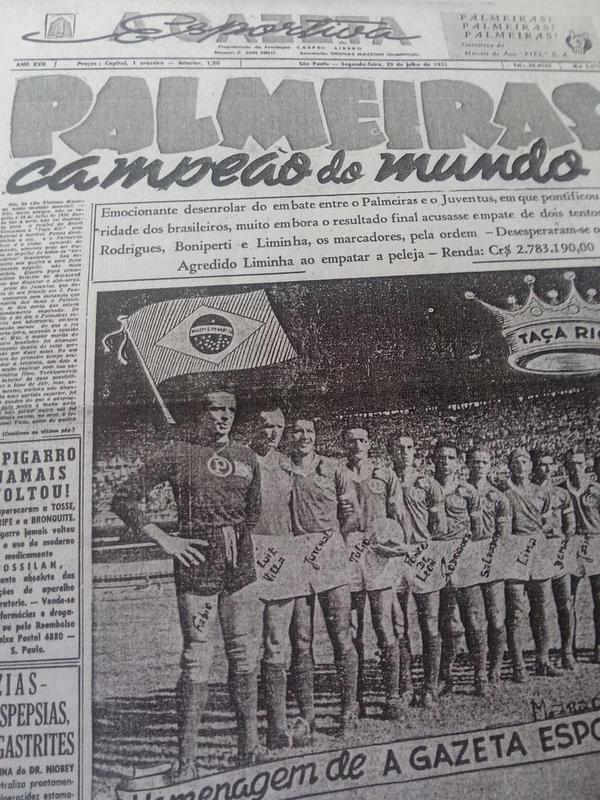 The title was at the time greatly commemorated all over Brazil, as Palmeiras lifted the trophy of the first International Interclub Championship. Finally, also FIFA seems ready to make the formal recognition. In an fresh interview for the newspaper “Estado de São Paulo”, FIFA president Joseph Blatter confirmed that Palmeiras would shortly be receiving a certification. Blatters’s statement annoyed FIFA press officers present during the interview, possibly because he shouldn’t be spilling the beans. No harm done, Mr. Blatter: we knew a recognition would come sooner or later.